Make yourself at home in one of the 25 air-conditioned rooms featuring refrigerators and flat-screen televisions. Complimentary wireless Internet access keeps you connected, and cable programming is available for your entertainment. Private bathrooms with showers feature complimentary toiletries and hair dryers. Conveniences include desks and coffee/tea makers, and housekeeping is provided daily. 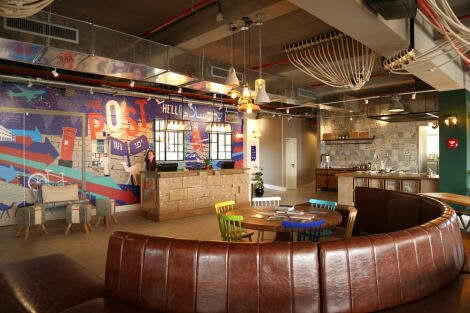 Stylish hotel near Knesset and Israel Museum, with indoor pool and city views Ideal for both business and leisure, Crowne Plaza® Jerusalem hotel is a 45-minute drive from Tel Aviv's Ben Gurion International Airport (TLV). We offer guests a free shuttle service to the historic old city, or you can also catch a bus just outside the hotel. Jerusalem Malha Railway Station is around 10 minutes away by car. We're five minutes' walk from a multi-screen cinema and shopping complex. It's a ten-minute drive to the Israeli Museum, and five minutes by car to the Knesset, seat of national parliament. Here for work? 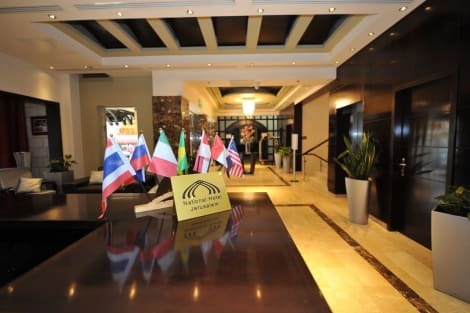 We're a five-minute walk from the International Convention Center. Meanwhile, our own Conference Centre can accommodate up to 1,000 guests. Free WiFi will help you stay Completely Connected. If you're throwing a party, invite up to 500 diners for a banquet in our ballroom. Our Crowne Plaza Meetings Director will keep everything running smoothly. Our fitness centre, spa and indoor pool help you unwind at the end of a day of sightseeing. For dinner, choose from a wide range of dishes at our Aluma Restaurant. Relax with a cold beer in the Genessis lobby bar, or take in the views from our 21st-floor club lounge. Many rooms have balconies with panoramic views of Jerusalem, and our premium bedding ensures a sound night's sleep. Featured amenities include complimentary wired Internet access, a 24-hour business center, and limo/town car service. Event facilities at this hotel consist of a conference center and a meeting room. A roundtrip airport shuttle is provided for a surcharge (available 24 hours), and free valet parking is available onsite. 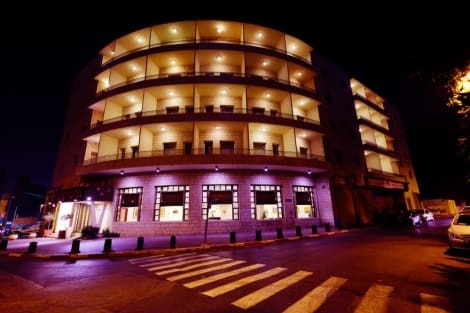 When you stay at Jerusalem Gate Hotel in Jerusalem, you'll be connected to a shopping center, within a 15-minute drive of Machane Yehuda Market and Israel Museum. 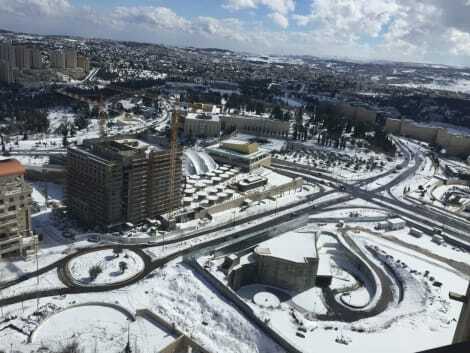 This hotel is 4.2 mi (6.8 km) from Al-Aqsa Mosque and 4.3 mi (6.9 km) from Western Wall. Make yourself at home in one of the 104 air-conditioned rooms featuring refrigerators and LCD televisions. Complimentary wireless Internet access keeps you connected, and satellite programming is available for your entertainment. Private bathrooms with showers feature complimentary toiletries and hair dryers. Conveniences include desks and blackout drapes/curtains, and housekeeping is provided daily. Make yourself at home in one of the 45 air-conditioned guestrooms. Your room comes with a Select Comfort bed. Complimentary wired and wireless Internet access keeps you connected, and cable programming provides entertainment. Bathrooms have showers and complimentary toiletries. For lunch or dinner, stop by Three Arches Dining Hall, a restaurant that specializes in Middle Eastern cuisine. Dining is also available at the coffee shop/café, and 24-hour room service is provided. Quench your thirst with your favorite drink at the bar/lounge. A complimentary buffet breakfast is included. The holy city of Jerusalem, one of the oldest settlements in the world is the perfect destination to awaken your interest in history, theology and architecture. Incredible archaeology lies waiting to be discovered next to revered sacred buildings, with dwelling places butting up to souvenir shops and restaurants. This is a city that has been besieged numerous times over the last two thousand years. Enough of the old city remains to be named a World Heritage Site and is a magnet to tourists and pilgrims alike. Choose from a wide selection of Jerusalem hotels that offer the chance to explore the true majesty of this incredible place. Sacred to Muslims, Jews and Christians alike, there are many Holy sites within the Old City of Jerusalem worth visiting. Located in the Jewish Quarter, the Western Wall, often known as the Wailing Wall, is one of the must see attractions. It's believed to be the outer wall belonging to a holy temple built in 538BC and later destroyed in 70AD by the Romans. It is possible to take a tour through the Western Wall tunnels, which run the length of the wall below ground. Walk to the Mount of Olives, so named because of the olive groves that used to cling to its slopes before visiting the Tomb of Prophets, the Church of All Nations, Gethsemane Garden and the Tomb of the Virgin Mary. Take a stroll to Temple Mount, one of the most important religious sites in the city. Here you will find the Dome of the Rock, the Al-Aqsa Mosque and the Dome of Chain. Walk in the footsteps of many Christian Pilgrims along the Via Dolorosa. This stretches from the Antonia Fortress to the Church of the Holy Sepulchre, where it is believed Jesus walked, carrying his cross. As you wander around the Old City, weave your way along the ancient alleyways of the Shuk, where pottery, clothing, souvenirs and food are sold in abundance. Assault your senses when you visit the Machane Yehuda Market. Here you can buy fresh fruit, cheese, wine and a whole variety of exotic dishes. This is a vibrant, buzzing place, bathed in colour, with spice lingering in the air. Visit the Yad Vashem Holocaust Memorial, situated within a 45-acre campus, which includes a number of museums, education centres and memorial gardens. There's also the Israel Museum, which contains an outstanding collection of prehistoric archaeology as well as some incredible contemporary art. For a taste of life 2000 years ago, take a guided tour around the Bet Guvrin-Maresha National Park, with its many archaeological sites, recording thousands of years worth of human history.